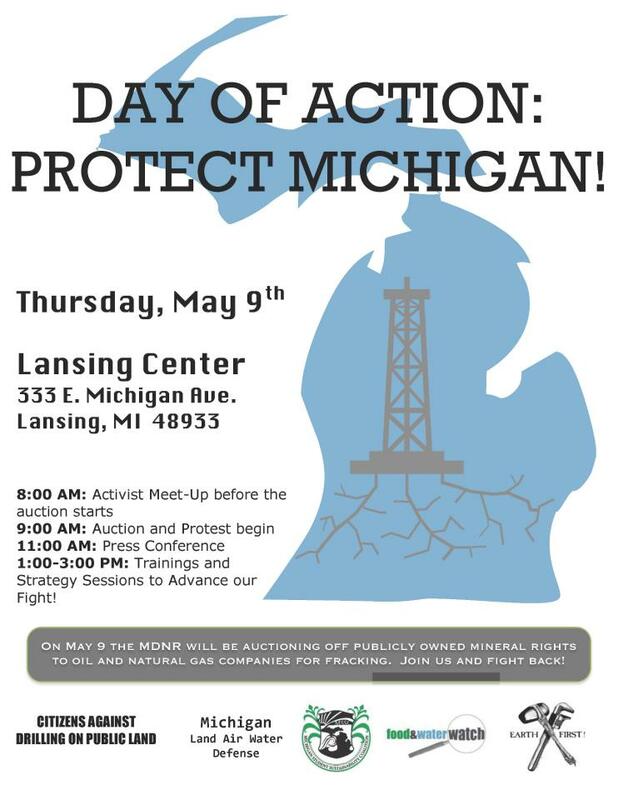 The State of Michigan continues its massive industrialization of our state, enabling the frack industry to take over the entire Lower Peninsula at the May 9, 2013 auction later this week. Click here for the DNR’s website on the auction. Do you live in Alpena, Antrim, Arenac, Crawford, Grand Traverse, Huron, Ionia, Kalkaska, Manistee, Midland, Newaygo, Oakland, Oceana, Ogemaw, Oscoda, Otsego, or Wexford counties? These are the counties with land parcels up for mineral rights leasing. ACT LOCALLY: FIGHT BACK WITH THE BALLOT INITIATIVE. If you can’t get to the auction, hold a Committee to Ban Fracking in Michigan event in your area to collect signatures for the ballot initiative. Contact Committee to Ban Fracking in Michigan to register as a volunteer using the Volunteer button. The Ballot Initiative will Ban Horizontal Fracking and Frack Wastes Statewide. After these lands are leased out, the only options we have to stop fracking is to ban fracking locally and ban fracking statewide. MLAWD’s lawsuit to undo some of the leases on state-owned parklands and game areas will help some areas to be protected. Committee to Ban Fracking in Michigan will be there. Committee coordinators will train new circulators. Petitioners plan to fan out on the streets of Lansing and at the Capitol as well as outside the Lansing Center to gather signatures.